Lepidiolamprologus attenuatus is a species of concern belonging in the species group "fishes" and found in the following area(s): Burundi, Democratic Republic of Congo (Zaire), Tanzania, Zambia. Copyright Notice: This article is licensed under the GNU Free Documentation License. It uses material from the Wikipedia article "Lepidiolamprologus attenuatus". Glenn, C. R. 2006. "Earth's Endangered Creatures - Lepidiolamprologus attenuatus Facts" (Online) - Licensed article from Wikipedia: The Free Encyclopedia. Accessed 4/18/2019 at http://earthsendangered.com/profile.asp?sp=10795&ID=1. Need more Lepidiolamprologus attenuatus facts? 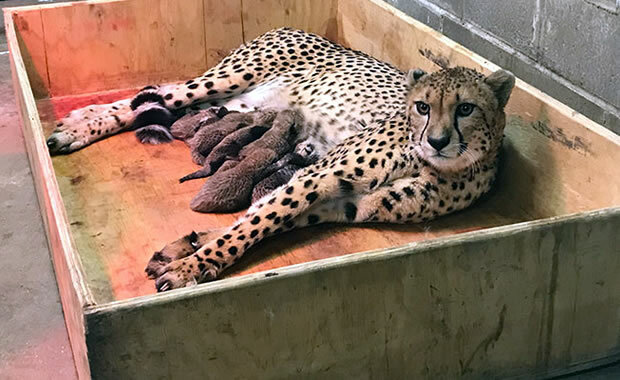 For the first time in history, a captive cheetah has successfully given birth to eight healthy cubs. It is said that only around 10,000 cheetahs remain in the wild in Africa along with 100 or fewer in Iran.